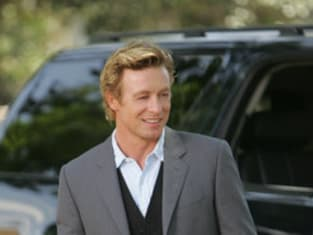 Here's a photo of Patrick Jane from the episode "Red Hair and Silver Tape." The detective is on the case! The Mentalist Season 1 Episode 2: "Red Hair and Silver Tape"
Grace Van Pelt: I don't get it. She actually enjoyed helping him kill. One crazy, evil person I understand, but two? Husband and wife? Marriage is suppose to be a sacred, loving thing. Patrick Jane: Yeah, they were soulmates in their strange own way. Patrick: No such thing as psychic powers. Sheriff McAllister: So what is it you do exactly? Patrick: You know rock paper scissors?